"These are a very tasty treat for snacking or parties!" Place the pumpkin seeds on a cookie sheet, and spread them out into a single layer. Roast until brown and crisp, about 45 minutes. Set the seeds aside in a large bowl. Place the cinnamon, chili powder, and 1 teaspoon of sugar in a bowl, and set aside. Place olive oil and 1 tablespoon of sugar in a heavy saucepan over medium-low heat, and heat and stir with a wooden spoon until the sugar turns a light golden brown color. Watch it carefully to avoid burning. Pour the caramelized sugar mixture over the roasted pumpkin seeds, and stir to coat. Pour the cinnamon-chili powder mixture over the seeds, and toss to coat the seeds with the spices. 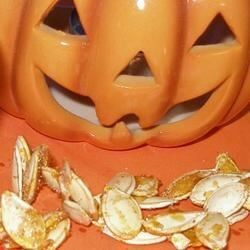 Awesome, the best pumpkin seeds I've ever made or eaten.